As with last Sunday here's another illusion. I did publish one of the photos briefly in 2010. The photos are of a man sitting on nothing. 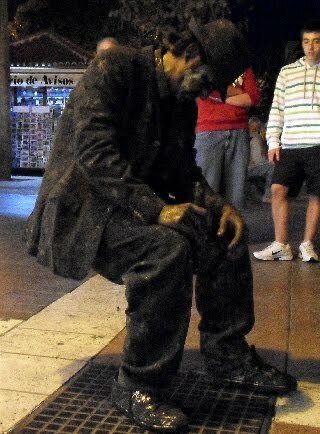 I snapped the pictures of this street entertainer when my wife and I were in the Canary Islands last year. Normally he had loads of people around him, as what he does looks to be impossible. This particular time we caught up with him just as he had arrived (on the bike seen in the bottom photo). I dropped a coin in his tray and walked round and round him close up - there were no strings attached! He appeared as if sitting on a chair, but there was no chair. Occasionally he would move himself slightly, as if to get more comfortable on his invisible seat. These street performers are awesome. Their dedication to the art of showing the impossible is possible makes my breath catch. They appear where many can see them, and many observe them as entertainment. The many walk on not even contemplating the physical skill and challenge to known laws of physics. To those that see, art and science are in balance. Love street performers. Every evening in Key West, dozens of them do their thing on the boardwalk - fire eaters, trapeze artists,an escape artist who rivals Houdini. The man in the picture must have incredible strong thigh muscles to be able to hold that position! what a pose!!! can't even imagine getting there in the first place, let alone staying!!! love street performers too, one of the things i miss by not being in metro areas - great photo! That man must have VERY fit leg muscles! Incredible! He has supports from his feet, up his legs and under his...um...seat...to support him. It's not magic or strength - it's illusion. It's not leg muscles... Some of them do impossible posture as demonstrated at the British airline of a man clearly leaning all the way back. There is a trick and I'm gonna find it!